Yisrael Beytenu head slams prosecutor's indictment of soldier with manslaughter, says pride - not justice - is driving the case against him. Yisrael Beytenu chairperson MK Avigdor Liberman on Thursday responded after the military prosecutor officially served an indictment on manslaughter charges an IDF soldier who last month shot a wounded terrorist in Hevron. 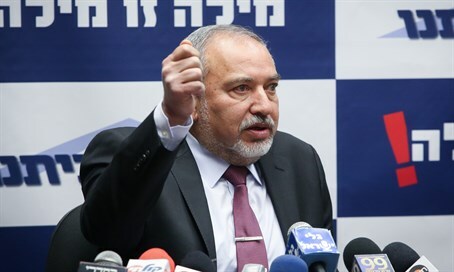 Former Foreign Minister Liberman said, "it's too bad that the military prosecutor hasn't gotten a hold of itself and (instead) continues to stick to a warped version according to which the soldier from Hevron is guilty of manslaughter." "Today it's already clear that there is no room for accusing the soldier on a clause like this, and the only reason that it's the clause that appears (on the indictment) is in order to align with the initial pouncing (on the soldier) and the unjustified verdict of the Defense Minister against the soldier at the start of the case." Noting on the progress of the case, he added, "today, after the things that occurred during the event are already clear, there is no doubt that even if the soldier did not act in accordance with the orders, he did so due to the special circumstances at the scene, and there is no reason to accuse him of manslaughter." "It would be better for the military prosecutor and all the rest who rushed to pass a verdict to back up from the ledge they ran to and not continue to harm the soldier due to matters of individual pride and an inability to admit mistakes," concluded the MK.